The pleasures of fishing are naturally and almost invariably connected in our minds with warm weather particularly with Spring or the first coming of Summer the bright freshness of bursting bud and new opening wild blossom and with those latter days in the Autumn over which the Summer King sheds his brightest glories. But in our northern and easterly States when old Winter has spread his mantle of frost and snow over the face of Nature and hermetically sealed all the lakes and ponds under covers of ice as an agreeable addition to the fun of skating hardy red cheeked boys cut round holes in the thick ice and through them rig their lines for pickerel. 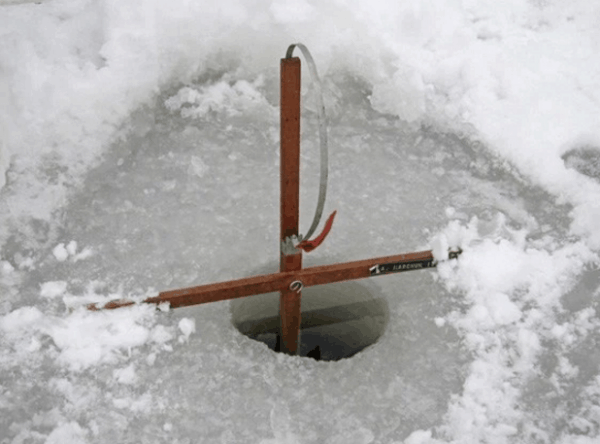 The fish itself will give the signal for the particular line that requires attention The construction of this automatic fishing tackle is so simple that it may be made in a few moments by any one. At the end of a light rod a foot or two in length is fastened a small signal flag a piece of any bright colored cloth answers the purpose. 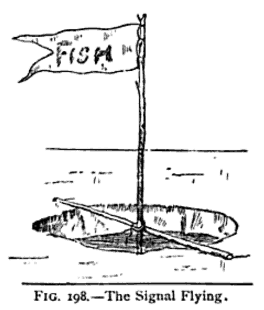 The signal Flying injecting over the cross stick to this short end the line and hook are fastened The hook is baited with a live minnow or other suitable bait and lowered through the hole The tackle is then in readiness for the capture of a pickerel When the fish is hooked his struggles keep the flag flying Fig 198 .